This is another catch-up post — we had this spicy (maybe a little too spicy for Lisa) soup last week, but I was too busy to put it up. It comes from Healthy Latin Cooking. Yeah, it’s perfect… just the way I like it. You always forget that you can always add more spice if you want, but if it’s too hot for me I can’t take spice out. Take spice out? Too hot? Huh? Just kidding. Okay, next time, I’ll make it less spicy and make mine hotter at the table. You have to admit, though, this is good. It *is* really good (but spicy)! I like the garbanzos, we usually don’t have those in our Mexi-soups. Heat a large nonstick skillet over medium-high heat. Add the tomatoes and roast, turning occasionally, until the skins blackens and blisters. Remove from the skillet and cool, and then use a a paring knife to remove the skin. Transfer to a blender, add the chipotles, and puree until smooth. Head the oil in a large saucepan over medium-high heat. Add the onions, garlic, and most of the scallions. Cook, stirring, for 5 minutes, or until browned. Increase the heat to high, and add the pureed tomatoes. Cook, stirring, for another 5 minutes or until thickened and your kitchen smells awesome. Stir in the chicken, chickpeas, stock, and epazote. Season with salt and pepper. Reduce the heat to medium and simmer for 20 minutes or until the chicken is fully cooked. Ladle into bowls and sprinkle with additional scallions. 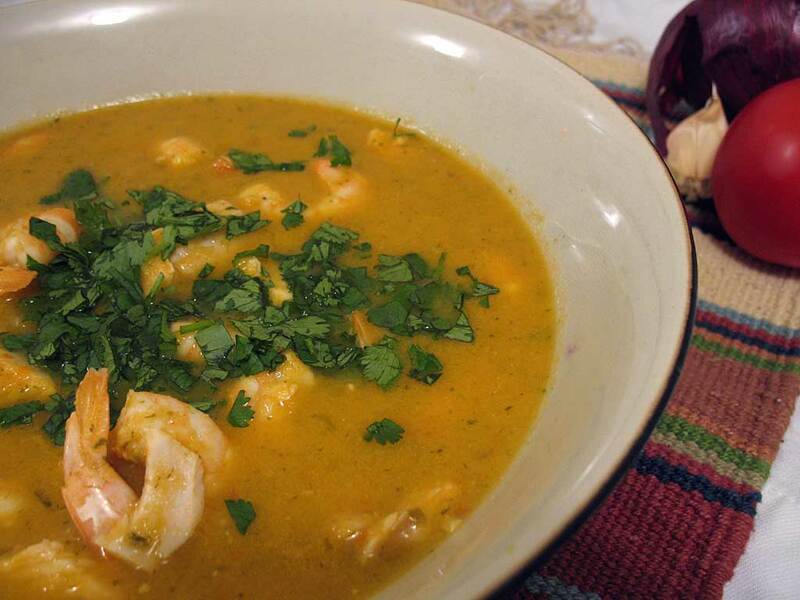 This is the second version of Moqueca we’ve attempted, and it couldn’t be more different than the first. In this version, as featured in Healthy Latin Cooking, you puree the stock, onions, peppers, and tomatoes, which creates a thick broth to which you add the fish (in our case, mahi mahi) and shrimp. It worked really well over rice. This is WAY different than the other one we made. Before you put the fish in, it looked like a butternut squash soup! I don’t know which one is more traditional, but they’re both really good. I like this recipe — there’s only a cup of coconut milk in this but it’s so rich and creamy. More please. In a shallow 13″x9″ glass baking dish, combine the fish and shrimp. Add the lime juice and one-quarter of the garlic. Season with the salt and pepper, toss to coat. Cover and marinate in the refrigerator for 30 to 60 minutes. Meanwhile, heat the oil in a large, nonstick skillet over medium heat. Add the onions, scallions, bell peppers, and the remaining garlic. Cook, stirring often, for 6 to 8 minutes, or until the vegetables are soft and translucent but not brown. Increase the heat to high. Add the tomatoes and cook for two minutes or until most of the juice from the tomatoes has evaporated. Stir in the stock and 1/4 cup of the cilantro. Cook for 10 to 15 minutes, or until slightly reduced and richly flavored. Remove from the heat. Transfer the vegetable mixture to a blender. Puree until smooth. Return to the skillet. Add the coconut milk and reduce the heat to medium. Simmer for 3 minutes. Add the fish and simmer for 3 minutes. Add the shrimp and simmer for 2 minutes more, or until the fish and shrimp are opaque. Sprinkle with a pinch of ground pepper. Season with more red pepper, salt, and black pepper, if desired. Sprinkle the remaining cilantro on top. 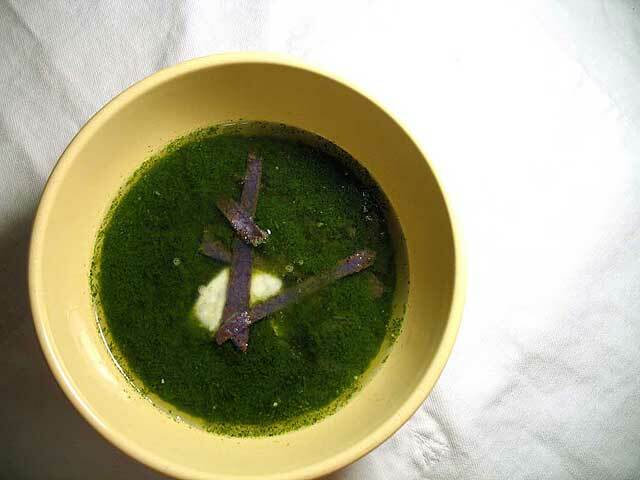 I’d been looking forward to making this soup for a while but was waiting for an opportunity to have it as a starter. That plan came to fruition tonight. 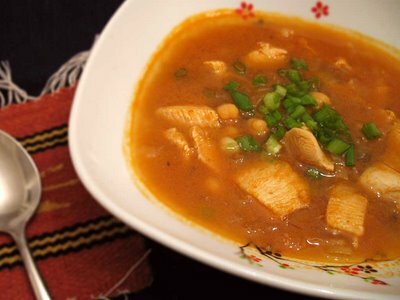 We enjoyed this soup, based on a recipe in Healthy Latin Cooking, as a first course before moving on to our Tuna Machaca. Whoa, is this as healthy as it seems? It’s really good, and thicker than it looks. Yep, it’s really healthy — basically just an entire bunch of cilantro, some peppers and onions, and chicken broth. Harder than making it, that’s for sure. Preheat a broiler to high. Place the chile pepper directly under the broiler. Roast, turning once, for 6 to 8 minutes or until charred and blackened on all sides. Transfer to a paper bag. When cool enough to handle, scrape off as much of the skin as possible. Split the pepper and remove and discard the seeds. In a food processor, combine the chile pepper, cilantro, onion, and garlic; puree until smooth. Transfer to a large saucepan. Pour in the chicken broth and simmer over medium-high heat for 5 to 8 minutes. The soup should be highly seasoned; sprinkle with salt and black pepper. Reduce the heat to low and keep warm. Ladle the soup into bowls. Spoon low-fat sour cream into the center of each bowl. Sprinkle with tortilla strips and queso fresco. We like to try out new recipes when we have friends over, and we were in the mood for fish, so we tried out this recipe from Healthy Latin Cooking. In spite of the late hour (or maybe because of it?) the dish got quite a few compliments. 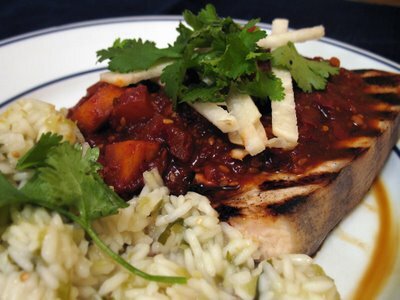 The sauce had many distinct flavors in it (from three types of roasted peppers, roasted tomatoes, pineapple, and plantains) and a deep dark red color that really contrasted the white of the swordfish. We served it with the green rice that we listed a few weeks ago. This was one of Lisa’s favorite dishes all year. Sprinkle the swordfish with salt and pepper. Place in a 13″ x 9″ glass baking dish. Sprinkle both sides with the lime juice and garlic. Cover and marinate in the refrigerator for 30 to 60 minutes. Meanwhile, tear open the guajillo and ancho chiles. Remove and discard the seeds and stems. Roast the peppers on a dry nonstick skillet over dry heat for 10 seconds; do not burn. Place in a medium bowl. Add the stock or broth, place a small dish on the peppers to keep them covered, and soak for 15 minutes or until softened. Transfer the peppers and stock to a food processor. Roast the tomatoes and jalapeños in the skillet for 5 minutes or until the skins blister. Scrape off the burnt skin and seed the tomatoes and peppers. Transfer to the food processor. In the same dry skillet, over medium heat, roast the almonds and sesame seeds for 3 to 4 minutes, or until browned. Transfer to the food processor, and puree all ingredients until smooth, working in batches if necessary. Heat the oil in the skillet over medium heat. Add the cinnamon stick, plantains, pineapple, and the pureed sauce. Simmer, stirring often, for 20 minutes or until thick and flavorful and the plantains are cooked. Season with more salt and pepper if desired. Remove the cinnamon stick. Preheat a BBQ and grill the swordfish for 4 minutes per side or until firm and white and the fish flakes easily with a fork. Transfer to a platter and spoon the sauce over the top. Top with the jicama and cilantro. Turkey Picadillo on Plantain "Surfboards"
Another delicious, low-fat recipe from Healthy Latin Cooking — in this one, the ground beef in traditional picadillo is replaced with ground turkey. I was a little skeptical with the inclusion of raisins, but it worked really well. Lisa’s not a huge fan of green olives, capers, OR raisins, but she was singing the praises of this dish all night. 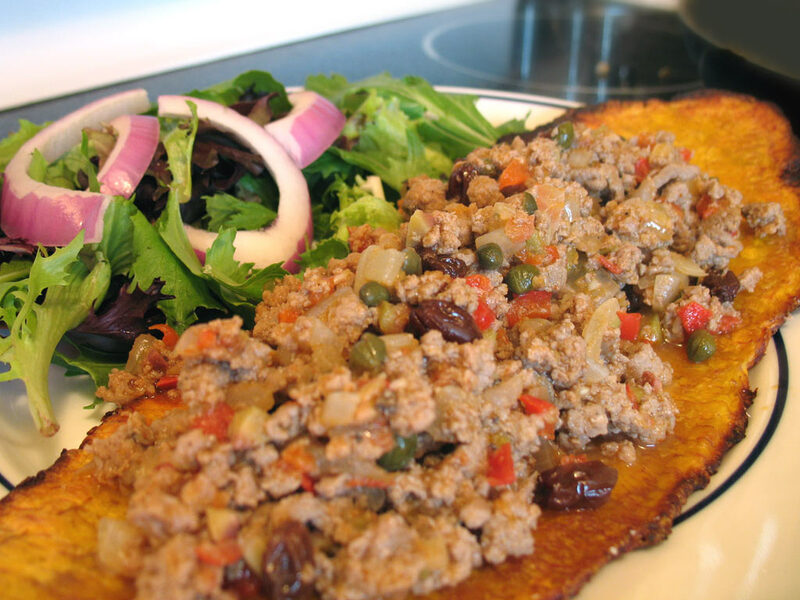 We placed the picadillo on plantain “surfboards”: plantains boiled, then rolled out flat and baked until crisp on the outside. The recipe specifies to do the plantains one at a time, but I was able to do 2 by temporarily using a third pan when flipping them over. Preheat the oven to 400. Coat 2 large baking sheets with nonstick spray. In a large pot over high heat, combine the plantains and stock or water. Bring to a boil. Reduce the heat to medium and cook the plantains for 20 minutes or until soft. Drain. Place a plantain between 2 large sheets of plastic wrap. Gently flatten it by tapping with a rolling pin. Roll it out to form a large flat oval about 12″ long, 5″ wide, and 1/8″ thick. (If the ends break apart, push them together with your fingers.) Slide the plantain onto the back of a prepared baking sheet. Lift off the top sheet of plastic wrap. Lightly brush the plantain with some of the oil and season with salt. Place another baking sheet on top, bottom side up. Invert the plantain onto it. Peel off the other piece of plastic wrap, brush the plantain with oil, and season with salt. Bake, turning once, for 20 minutes, or until crisp and lightly browned. (To flip, place a baking sheet on top, then invert the plantain onto it.) Transfer to a large serving plate. Repeat with the remaining plantains. In a medium bowl, combine the turkey, cumin, 1 tsp salt, and 1 tsp black pepper. Mix well with a spoon and let stand for 5 minutes. Heat the oil in a large nonstick skillet over medium-high heat. Add the garlic, onion, and bell pepper. Cook for 4 minutes, or until the onions are just beginning to brown. Stir in the tomatoes and cook for 2 minutes. Crumble the turkey into the skillet. Cook, breaking up the turkey with a spoon, for 3 minutes or until it starts to turn white. Stir in the olives, raisins, and capers. Cook for 2 minutes more. Stir in the caper juice, wine, and tomato paste and bring to a boil over high heat. Reduce the heat to medium-low and simmer for 6-8 minutes or until the turkey is tender and no longer pink in the center and most of the liquid has evaporated. Season with more salt, pepper, and cumin, if desired.